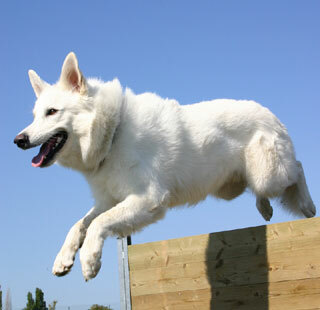 How high can GSD's jump? My old guy used to jump up (and down) from the yard onto front porch... the wall was a good 6 feet high and he could clear it no problem from a stand still... my roommates dog, a lab shepherd cross, couldn't even get close. When Jasper was a puppy (from about 5 months old) he would scale the back fence which was about 5 feet high or so. These dogs are very agile and athletic. My GSD, when motivated, can scale a six foot fence.